WMATA first broke ground on construction in December 1969 and began the complicated process of navigating the spaghetti cake of buried utilities along the right of way, the oldest of which dated back to the industrial revolution. Many of the downtown tunnels and stations were excavated using a cut and cover technique. The transit agency would close down streets, excavators would dig a pit (or 'cut'), and they would throw wooden decking over the top while concrete and finishing work unfolded below. 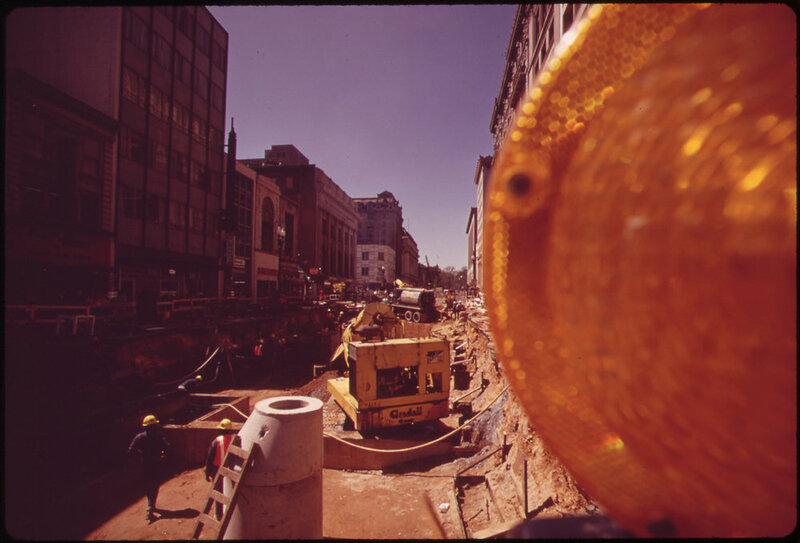 When the tunnel was complete they would backfill in the cavity with earth, repave the street, and street life could resume its familiar routines. Cut and cover was the cheaper and faster alternative to tunneling with underground boring machines, but also created severe disruptions across the city: long lines of gridlock, and losses of foot traffic for businesses unlucky enough to find themselves next to the pits. Metro engineers had to go back and inspect some of Washington's oldest tunnels before crossing over their routes with subway tubes. In the scene below, Chief of the Washington Aqueduct Dan M. Watt descends 80 feet into the Lydecker Tunnel, where massive reinforcements were installed before the Red Line was built within ten feet of its aging brick walls. Any large tunnel project in Washington inevitably tangles with buried government communications lines. A Washington Post article from 1976 noted that subway excavators had “burrowed gently around wires linking space technicians on earth with astronauts exploring the moon.” WMATA even coordinated construction phasing with NASA’s scheduled moon flights to avoid unnecessarily risky overlaps. "Even a strip of the ‘hot-line’ between the White House and the Kremlin is said to have been uncovered” beneath Lafayette Square, the Post continued, before it too was carefully shielded and put back into place. Engineers faced different sets of problems beyond the central city. The hills around Washington rise atop the underground stratum of granite and limestone that grows into the Blue Ridge Mountains, miles and miles out to the west. The Red Line stations north of Dupont Circle and Silver Spring were blasted from this bedrock with powerful explosives, and the tunnels advanced by cylindrical boring machines the size of two story buildings. The deepest station of all, Forest Glen, sits 21 stories beneath suburban Montgomery County. Impracticably deep for escalator access, riders enter and exit the station through high speed 196 foot elevator shafts. When the first stretch of Metro opened to the public in 1976 the Washington Post declared it “a triumph of men and machines.” The tracks only stretched from Farragut North to Rhode Island Avenue - not much use for commuters - but the city was blown away by the spaces that awaited them underground. Expectations at the time were set by New York City's dirty, low ceilinged transit infrastructure. To a late-1970's observer, the Big Apple transit tunnels would have resembled mine shafts. This was the same subway once colorfully described by the New York Times as "a mobile torture chamber." Washington's new stations were an entirely different species of tunnel. WMATA's enormous concrete vaults are still breathtaking for first time riders, and their iconic coffered waffle patterns recall the Roman Pantheon or Capitol Rotunda. The lack of columns and long sight lines fill the stations with a soaring sense of space. There's enough room in the 600 foot long stations to lie the Washington Monument down on its side, and still have 50 feet left over. The effect is impressive down to the little details, like the brass and granite motifs that give the system its Federal feel. Metro has become the most influential tunnel system in Washington's popular psyche. The stylized map of tunnels on display inside Metro stations and cars has imprinted itself into the city’s wayfinding bedrock and collective lingo. Ask the average person where they live and you’re more likely to get the closest Metro station than a cross street. As much as the map informs our perception of geography, its distortion of scale also leads to common misconceptions. Think of the tourists who fail to anticipate the sheer size of the National Mall, or embark on ill advised stroller hikes all the way up to the Zoo.